Choose from a range of massage therapies. Not sure which to choose? Our hightly trained therapists are happy to tailor your individual session or design a treatment program to meet your specific needs. All treatments are best done on a relatively empty stomach. Swedish Massage: Long, flowing strokes with deep kneading motions are used to warm up and release tension in muscle tissues. 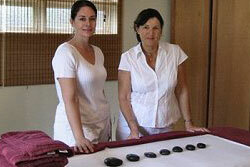 Hot Stones and aromatherapy maybe incorporated to enhance relaxation and thereapeutic benefits. Thai Yoga Massage: This ancient Ayurvedic practice blended with modern bodywork techniques, combines the best of yoga, massage and acupressure to stretch and soothe you from head to toe leaving you deeply relaxed and rejuvenated. Shiatsu Massage: Shiatsu - literally meaning Finger-Pressure - is a Japanese form of body work designed to heal and promote well being. Pressure and stretches are used to improve the flow of Qi (energy) within the body. This massage is performed on mats on the floor; loose comfortable clothing or yoga wear is recommended. Craniosacral Osteopathy: is a holistic philosophy and an alternative manual medical practice that aims to harmonise the relationship between the structure and function of the body restoring its inherent ability to heal and correct itself in cases of pain and/or impaired function. Acupuncture (seasonal): This ancient Chinese tradition uses thin needles to reopen blocked channels and improve the flow of Qi along energy pathways throughout the body. Emotional Freedom Technique: Accupressure techniques together with vocal affirmations are used to clear emotional blocks and promote psychological well-being. Aromatherapy: Our sense of smell is stongly connected to our emotional state through neural pathways to our limbic system. Certain essential oil extracts are proven to be therapeutic and beneficial to the mind-body connection. Hot Stones: Heated basalt stones of different sizes are used to actively work into tight muscles and to passively apply warmth and pressure to different parts of the body during this deeply soothing swedish style massage. Therapies are all created from a Holistic perspective and customized to your unique needs. Treatments are focused on finding the root of any issue you may have, with the intention to heal and to create a more harmonious Life. Feel free to call us for more information or to make an appointment (868) 639-8442.